These Unbreakable Stainless Steel Mirrors are manufactured from highly polished Stainless Steel and will give a bright, clear, distortion free reflection. 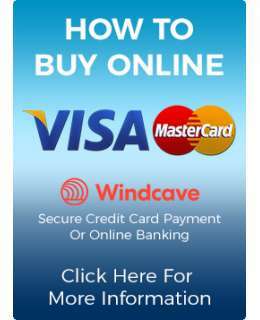 Ideal for preventing collisions in harsh industrial situations or in public areas which may be prone to vandalism. The highly polished stainless steel face will resist repeated blows and if attacked with graffiti and spray paint, can be easily cleaned with solvents. Are you looking for Unbreakable Anti-Ligature mirrors for Correctional or Behavioural Health applications? 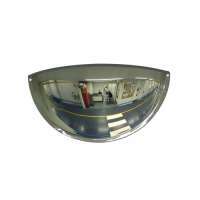 The 500mm Stainless Steel Half Dome Mirror is designed for preventing collisions at T-Intersections in harsh industrial situations or in public areas which may be prone to vandalism. 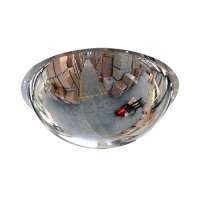 The highly polished stainless steel face will give a bright, clear, distortion free reflection and a 180° viewing are.. 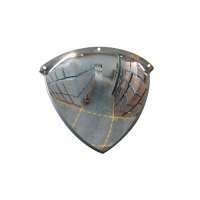 The 500mm Stainless Steel Quarter Dome Mirror is designed for preventing collisions at Right-Angle corners in harsh industrial situations or in public areas which may be prone to vandalism. The highly polished stainless steel face will give a bright, clear, distortion free reflection and a 90° viewi.. The 500mm wall mounted dome gives 180 degrees of vision and is ideal for preventing surprise attacks and collisions in vandal prone areas. The highly polished stainless steel face will resist repeated blows. 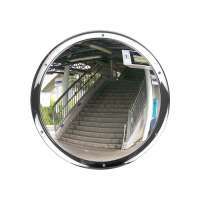 This mirror works best in areas such as car parking buildings, railway platforms, underpass .. 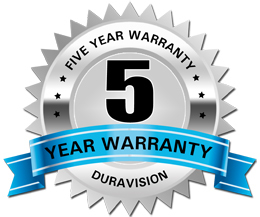 The 500mm Unbreakable Stainless Steel Full Dome Mirror is manufactured from highly polished 1.2mm Stainless Steel and will give a 360o area of reflection. Ideal for 4-way intersections in factories, warehouses and busy corridors in hospitals and schools. Ideal for preventing collisions in hars..